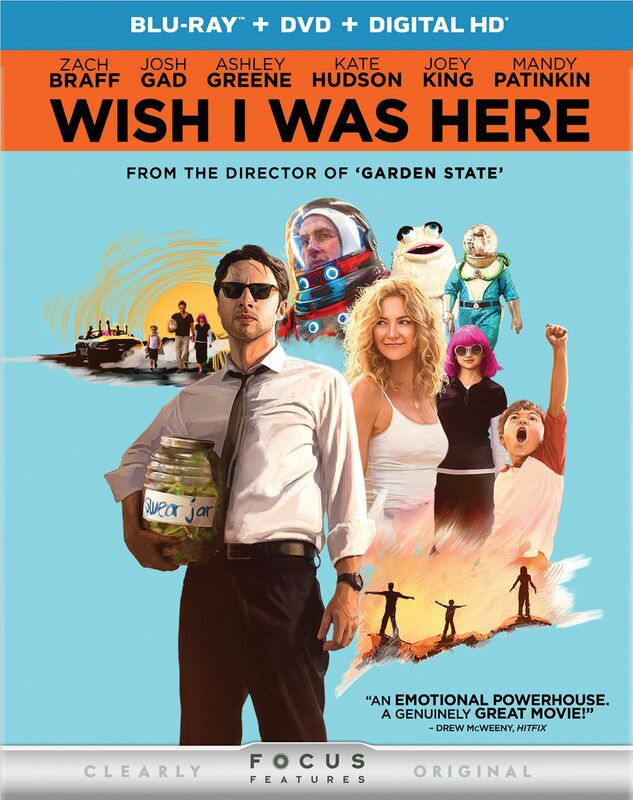 “Wish I Was Here” was what I said when this movie was not screened within 50 miles of my house. So, I just watched it on DVD and I am glad that it finally got here. Aidan (Zack Braff from “Oz The Great and Powerful“) is barely enough of an actor to be called struggling. At least there are other things he is struggling with, like being a father, a husband, a son and an enlightened human being. When his father’s (Mandy Patinkin from “Homeland“) health takes a turn and he can no longer pay for the grandkids’ schooling, Aidan has to grow up a little more. The first move Aidan makes is to home school his two kids, Grace (Joey King from “The Conjuring“) and Tucker (Pierce Gagnon from “Looper”). Unfortunately Aiden doesn’t really know anything, so he has nothing to teach them. Yes, Aidan is a man-child who survives by the grace of his loving and hardworking wife, Sarah (Kate Hudson from “Something Borrowed”). At least he is doing better than his brother Noah (Josh Gad from “The Internship”), who has chosen to avoid growing up at all. Aidan has lived his life acting like other humans, and now when faced with the essence of the human condition, he has to develop some new skills. His lack of faith and lack of ability to explain it all to his children are a new kind of struggle. Director/writer/actor Zach Braff has a way with family drama that is devoid of cliché and deeper than one would expect from the “Scrubs” actor. I was not a fan of him passing the hat to make this movie, but that is just my jealousy that I have to overcome. I concur with having less corporate currency and creeps controlling the cinema. Orson Welles had to beg for money that never came for decades, and I wonder what he would have made with crowd funding. I was moved by this movie, and that did not surprise me. The whole theme seemed designed to pull at the heart strings, so I set my jaw and was ready to take it on the chin. While the story took its shots, it hit me below the belt. For that reason, I must give this movie 4 stars out of 5. Now, you don’t have to wish you were here – you just need a DVD player.